Been so long since my last post. With this pregnancy, I’d been feeling blue for weeks. This week supposed to mark my second trimester, but the nausea and feeling of throwing up have not weaned out yet. But it was all worth it, specially when I saw the little noodle bouncing on my womb on the 19th. Alyssa was so excited… she cannot wait for the baby to come. She thinks it’s a girl since I am the one pregnant. She said, “It is a boy if Daddy’s tummy is the one getting bigger.” Yeah, ok. I thought it was funny. Well, we don’t know the gender, yet. My next appointment will be on the 14th, until then we are just letting Alyssa make the assumption and calling the baby “her”. Well, in another note, I saw this design featured on Yahoo News this morning. I went over the comments and almost everybody is all negative about it. 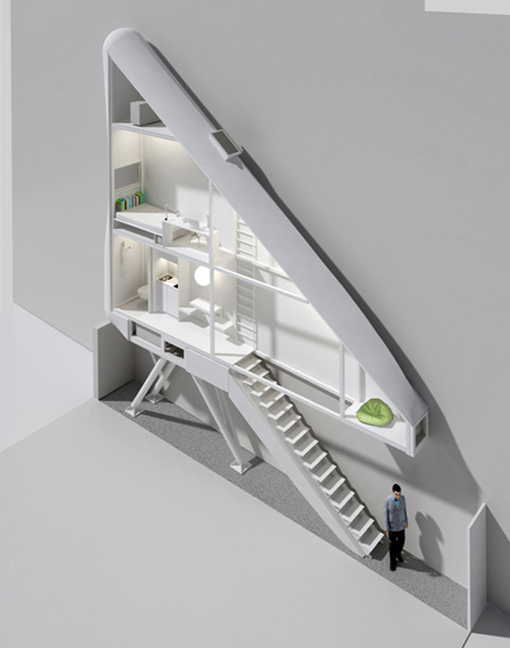 But, with today’s small space and expensive housing, I think it is a cool concept. It might be small, but it has all the amenities one need for daily living. You don’t stay in the house all day anyways, in fact, people spend more time outdoors (like school or work). It is just hard for most of us to sway around the common knowledge of what a house should look like. And, challenging the status quo is indeed the hardest thing to do. But the concept is possible. As one said, it is much better than cardboard boxes.